We're pleased to announce that TrayStatus 2.0.1 is now available for download! We encourage everyone to update to this new version today to take advantage of these improvements. We're pleased to announce that HashTools 3.0.3 is now available for download! We encourage everyone to update to this new version today to take advantage of these improvements. ASP.NET ViewState Helper 2.0.2 Now Available! We're pleased to announce that ASP.NET ViewState Helper 2.0.2 is now available for download! We encourage everyone to update to this new version today to take advantage of these improvements. We're excited to announce that we've recently released several updates to CheckCentral! We've added a "Description" field to checks and check groups, so that you can add additional notes about the check or group. There's also a new "Time of Day" parameter for checks, so that you can exclude certain hours in addition to the existing ability to exclude specific days. The Stats tab now has additional filtering capability so that you can easily find the information you're looking for. As an example, you can setup the filter to only show checks that have failed at least 2 times in the last 7 days. In addition to these updates, we've also made improvements to CheckCentral's email processing and other behind-the-scenes upgrades to keep everything running smoothly. Congratulations to our top contributing members for February 2016! They have been hard at work submitting, rating, and discussing images on WallpaperFusion, and have racked up some impressive reputation scores along the way! 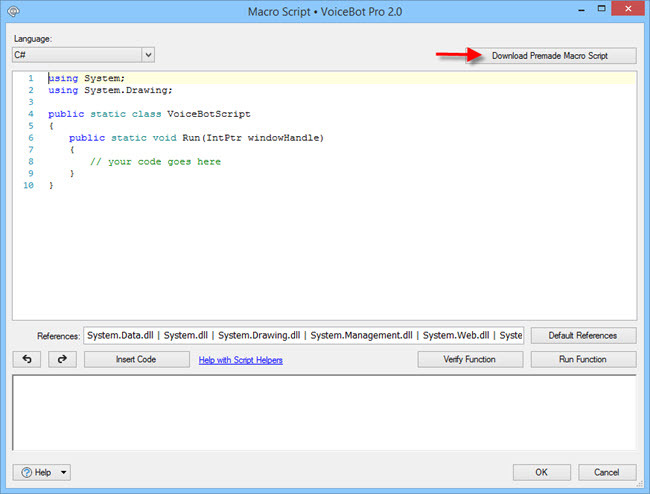 In the Macro edit window, click the Add button, and choose Macro Script. 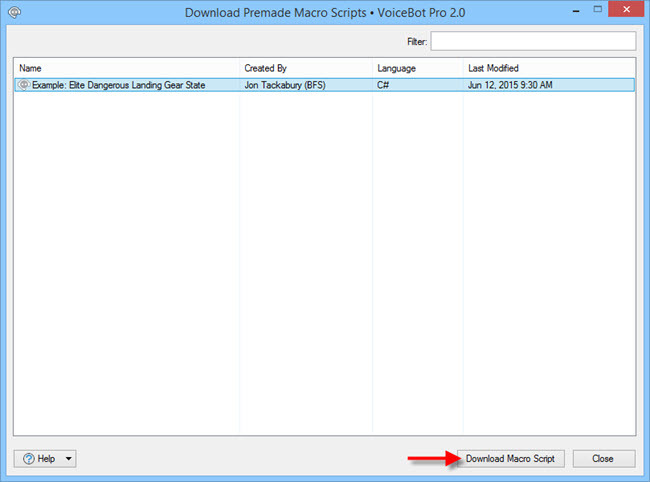 Click the Download Premade Macro Scripts button. 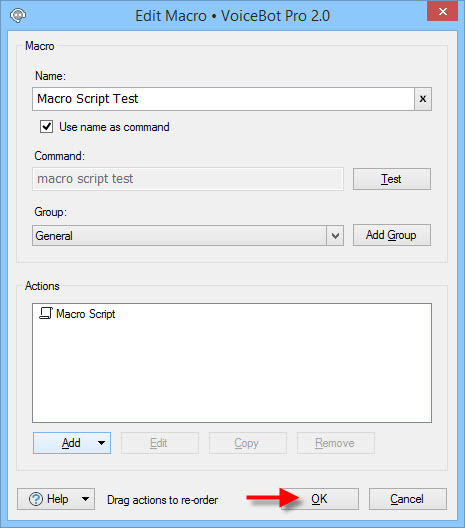 Select the script you want to download, then click the Download Macro Script button. 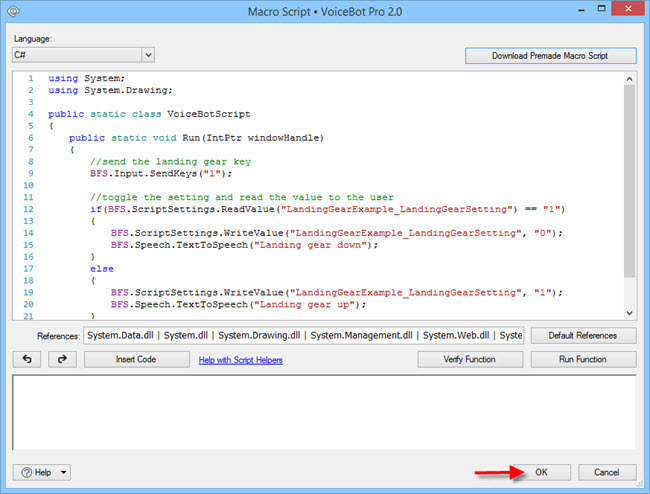 Click OK to save your new Macro Script action. Click OK again to save the Macro. Some types of HDMI monitors, and pretty much any DisplayPort monitor will be "disconnected" from the computer when powered off or entering sleep mode. This causes Windows to do a full display re-detection on sleep and resume, which has the nasty side effect of making all open application windows shuffle around. When returning to your computer, all of your carefully placed windows are now in random spots! DisplayFusion can help with this scenario by saving the window positions before the system sleeps, and restoring them when it wakes up. The steps below describe how to configure DisplayFusion to do this. Click OK to save the Trigger rule. 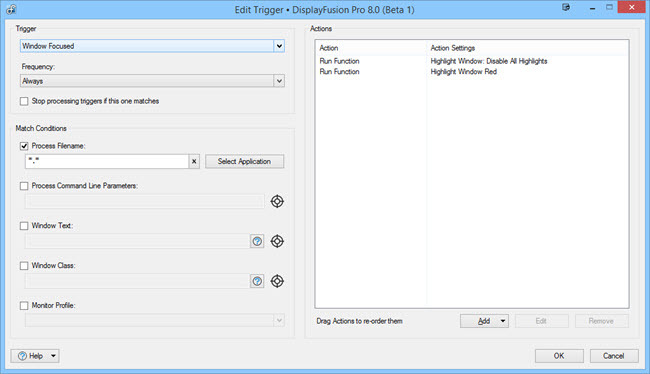 Click OK again to apply the DisplayFusion Settings. Note: If your system is not set to lock on sleep or screen saver, the window positions won't be automatically restored when resuming from sleep or screen saver. You can still manually load the positions by assigning a key combination to the "Restore Window Positions from Last Save" function on the Settings > Functions tab. DisplayFusion Triggers are a powerful and versatile way to automate your window management tasks. 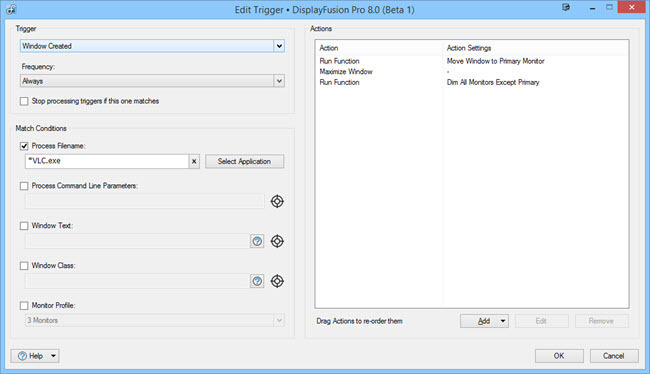 You can have multiple actions performed whenever certain things happen, like when new a window is created, a window is focused, or when DisplayFusion starts or exits. You can match windows based on their process path, command line parameters, window text (window title), and window class. Let's start with an overview of the different fields in the Trigger edit window. Event: Select what event should trigger this rule. 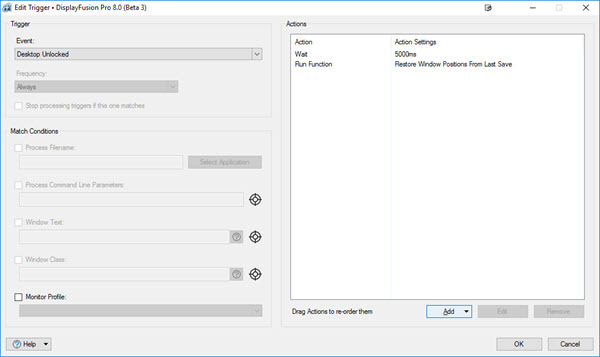 The current options are Window Created (when the window opens), Window Focused (when you click on or Alt+Tab to the window), DisplayFusion Starts (useful for loading a specific Monitor Profile on startup), and DisplayFusion Exits. Frequency: Here you can choose whether DisplayFusion will process this rule only once for each instance of this process (goes by process ID), once for only the first instance of this process (goes by process name), once for each window of this process (goes by window handle, useful when using the "Window Focused" trigger), or all windows for this process. In most cases you'll either want to use "Once-per-process ID" or "Always." 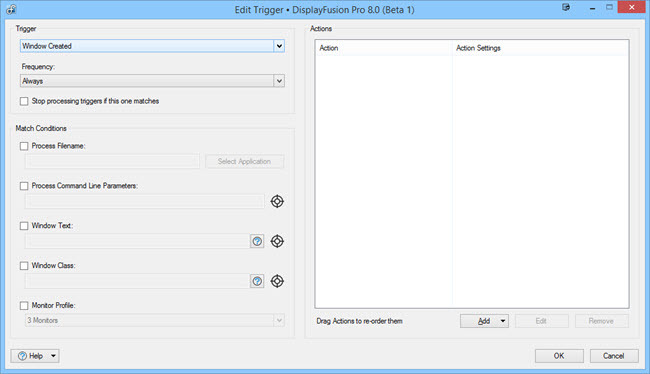 Stop processing triggers if this one matches: Enabling this checkbox will tell DisplayFusion to stop processing the rules on the Settings > Triggers tab if the window matches this rule. If you have a wildcard (*. *) rule after this rule in the list, you'd want to enable this checkbox if you don't want the window to be processed by the *. * rule. Process Filename: You can manually enter the path to the application, or click the "Select Application" button to choose it. This option also accepts wildcards (e.g. C:\Applications\*, or *.*). Process Command Line Parameters: In some cases, you may only want the rule to match if the program is running with specific command line parameters (e.g. if VLC was started with the --repeat parameter). Enter the parameters exactly in this option. You can view them for a running process by adding the "Command Line" column to the Windows Task Manager. You can also auto-populate this field by dragging the target icon and dropping it on the running program window. Window Text: This option will allow you to specify a full or partial window title to match by. You can auto-populate this field by dragging the target icon and dropping it on the window you'd like to grab the title from. This field uses our text query engine, allowing you to specify multiple titles, and exclude certain text as well. Window Class: This option will allow you to specify the window class to match. This is generally useful if you want to move only certain windows of an application (e.g. dialogs, settings windows, etc). You can auto-populate this field by dragging the target icon and dropping it on the window you'd like to grab the class from. This field uses our text query engine, allowing you to specify multiple classes, and exclude certain text as well. 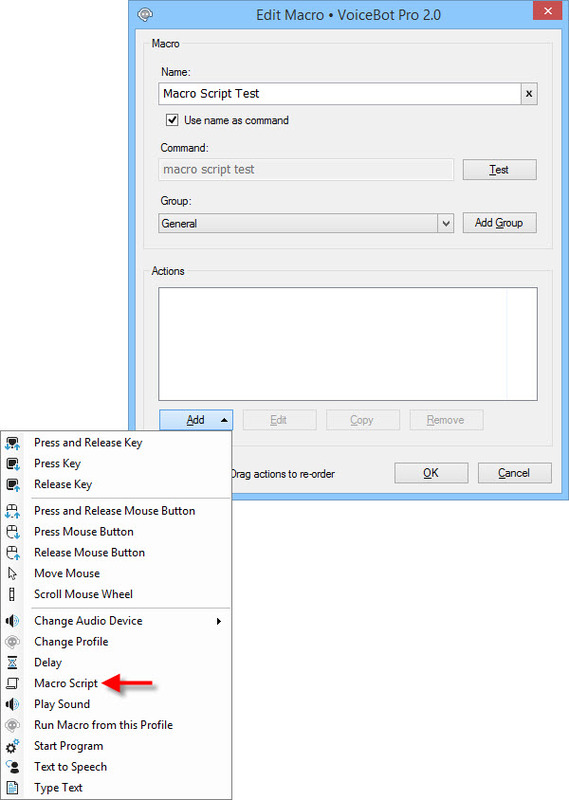 Monitor Profile: This option will allow you to limit the rule to a specific Monitor Profile. 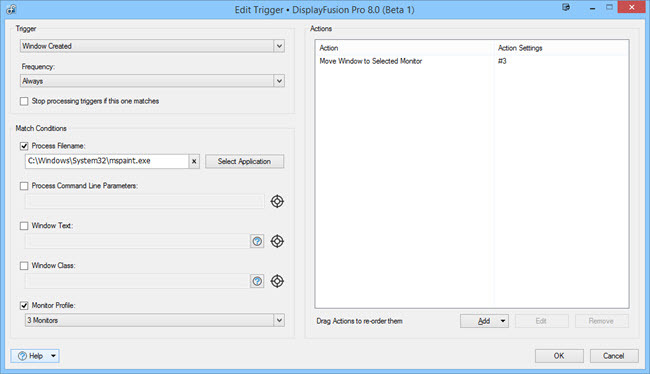 This way, you can have rules for the same program, but apply different Actions for different Monitor Profiles. Actions: This is where you'll add all of your moving, sizing, and other actions. Aside from moving to specific monitors and locations, and setting specific window sizes, you can also run built-in, custom, and scripted functions. For example, you can have a window be moved to a specific monitor, moved to the top-left corner, and set as "always on top." Actions in the list can be re-ordered by dragging them up or down with the mouse. We're happy to announce that DisplayFusion 7.3.4 is now available for download! This release fixes a login issue with a few of the wallpaper plugins, as well as an issue with DisplayFusion detecting the wrong DPI scaling value on some systems.